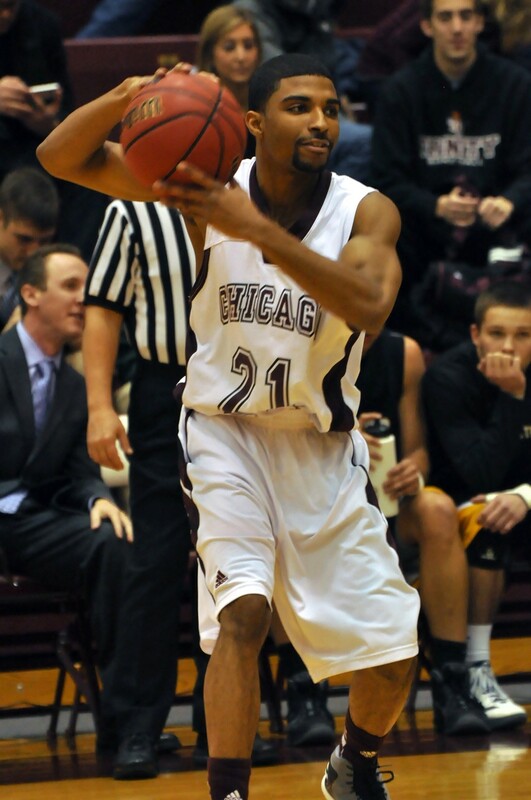 It was clear what the Maroons needed to do to beat archrival #5 Wash U: Control the boards. Going into the contest, the Bears (10–2, 0–1 UAA) had out-rebounded their opponents by an average of 16.4 rebounds per game, the largest margin in the nation. But on Saturday, it was the Maroons (7–5, 1–0 UAA) that had the margin over Wash U. Chicago totaled 41 rebounds compared to the Bears’ 35 en route to a 68–60 win. It is just as easy to point out what the Maroons need to do in order to play spoiler again, this time to #4 Rochester (12–0, 1–0 UAA)—contain point guard John DiBartolomeo. The senior leads the UAA in assists per game (5.9), points per game (23.7), and ranks second in three-point field goal percentage (50.8). DiBartolomeo has garnered first team All-UAA status the past two seasons and was named to the D3hoops.com Team of the Week. He is also this week’s UAA Athlete of the Week. In spite of all the praise McGrath gives DiBartolomeo, he said that the Maroons have an advantage that most teams do not have with two high-quality point guards in second-year Royce Muskeyvalley and third-year transfer Wayne Simon. Muskeyvalley averages 23.2 minutes per game compared to Simon’s 19.2. McGrath said that there is no secret to guarding the Rochester star. Both Muskeyvalley and Simon have shut down premier point guards this season. In the Maroons’ upset over the Bears, they allowed third-year Alan Aboona to dish out only two assists. He averages 5.8 per game. Still, Chicago will be faced with a difficult task against the Yellowjackets as a whole, especially since they are playing at Rochester. “I think Rochester is going to be more comfortable playing at home than Rochester was playing here, and that will make the challenge that much harder,” McGrath said. The Maroons will continue along the East Coast for Sunday’s game against Emory. With a healthy lineup, Chicago looks to contend for the UAA title after a 6–5 start in non-conference play.